It’s been a fairly busy week. I’m (still) working on getting my home office cleaned/organized, and that is part of the reason I have not updated so much recently. I also recently was hired by Allen Marine, a local tour company, to be a naturalist. Although I do not feel exceptionally qualified for the job, that’s probably more about my tendency to think about all the stuff I do not know, rather than to recognize all the things that I do know. Weather: The clouds and rain persisted through much of the week, though there was sun on a couple of days. There’s been a good breeze on a number of days. Temperatures in the upper-50s during the day. Birds: Saturday there was a flicker (possibly two) that was quite active around the house. It was calling loudly and would move around the trees in the area, leave for a time and then return. One thing I learned on the Allen Marine boats was just how close some of these water birds are to town. I was thinking they were well away, but there are many birds in among the islands. They are not so close to the road system, but I would not need to go out on big water to see them in a kayak. It was fun to see all the birds out at St. Lazaria on Wednesday. There were Tufted Puffins, Common and Thick-billed Murres, Pelagic Cormorants, a couple of Peregrine Falcons, a Black Oyster-catcher, aukets, gulls, murrelets, and probably a couple of others that I am forgetting. While on the beach near Shoals Point, I heard then saw a Greater Yellowlegs calling from along a creek just up from the beach. 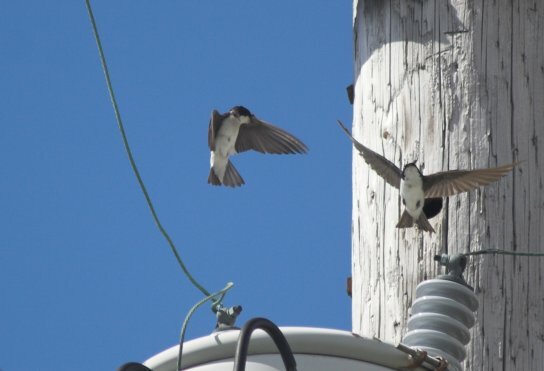 I spent a little time watching the Tree Swallows at their nest on Tuesday. I am not sure how long it takes these birds to fledge, but I imagine they will be fledging soon. While I was watching them, a guy told me that last year there had been sapsuckers in the nest. Flora: The beach peas were blooming along the beachs on Kruzof. The orchids seem to be close to blooming. I am not sure if Kruzof tends to be earlier or later than around town. Mammals We saw humpback whales on the tours. One of the captains also told me he saw a Minke Whale while we were on the beach. There were quite a few sea otters with pups near Black Rock. There were also some in other locations. Along the beaches I saw many deer tracks, as well as mink, river otter, and possibly marten tracks. This entry was posted in birds, daily, flora, marine, photo. Bookmark the permalink.